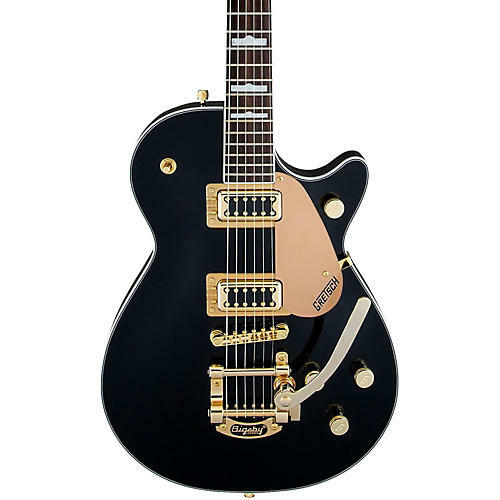 Capture the highly coveted cool of the elusive Penguin at an attainable price with the all-new G5435TG-BLK-LTD16 Limited Edition Electromatic Pro Jet with Bigsby and Gold Hardware. Available in a striking black finish, the Pro Jet’s single cutaway chambered basswood body and arched maple top typifies the classic vibe of the rare Penguin. It also offers some cosmetic personality of its own, including head-turning gold hardware, gold plexi pickguard, and sleek and stylish white headstock binding. Other classic features include dual "Blacktop" Filter’Tron pickups, Bigsby B50G tailpiece, rosewood fingerboard with 22 medium jumbo frets and pearloid “hump-block” inlays, three-position pickup toggle switch, anchored Adjusto-Matic bridge, “G” arrow knobs, and threaded knurled strap buttons. Case sold separately.